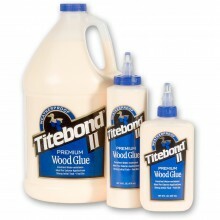 The Titebond aliphatic wood glue has been the professionals choice in the U.S.A. For many years, providing a strong initial tack, a fast set and a superior bond strength. The glue is non toxic and cleans up with water. Easily sanded when cured. Excellent heat and solvent resistance, and unaffected by finishes.Water resistant glue designed for exterior projects, kitchen worktops etc.Ideal for R.F gluing systems.Approved for indirect food contact.